Buruli ulcer, one of the neglected tropical diseases, has in recent years been spreading greatly, particularly in western Africa. What organism causes Buruli ulcer? 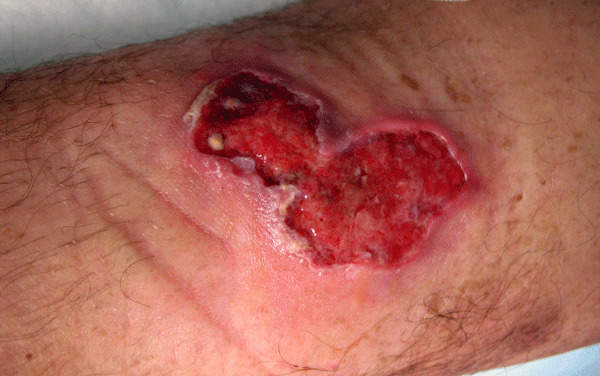 Buruli ulcer is a bacterial infection by Mycobacterium ulcerans. Like the agent of tuberculosis, it is a slow-growing, acid fast bacilli. But unlike TB, it is an organism that is found in wetland type environments. Where is Buruli ulcer found? The infection is found in over 30 countries throughout the globe, most are tropical areas. Africa is the place most affected with Buruli ulcer. This is has been the big question that has perplexed scientists. Some evidence points to the various creatures and flora that are present in wetlands. Snails, insects and fish normally harbor M. ulcerans and may be a souce of infection. Some suggest that the bite from a water-borne insect may be the source of infection. Most do agree that it involves introduction of the organism through some type of trauma. Environmental changes like dam construction and irrigation projects may be associated with outbreaks of Buruli ulcer. Farming in rural wetland areas may also contribute. What are the symptoms of Buruli ulcer? Typically it presents itself painless skin wound with a necrotic white or yellow base, typically seen on the extremities. The incubation time from the time of infection to a visible ulcer may be up to 3 months and probably only a small percentage of people infected actually get the disease. Untreated ulcers can cause bad scarring and ulceration resulting in severe deformities. The spread of the bacteria either directly or through the bloodstream, can affect the joints and bone. It is rarely fatal. Transmission of the infection from person to person is extremely rare. How is Buruli ulcer treated? Antibiotics and depending on the severity of the ulcer, surgery and skin grafts may be required. Several things to include avoiding insect bites, prompt cleansing of wounds, early detection and treatment of the disease and the use of the BCG vaccine may offer short term protection. And of course, educating the population of the causes of this disease is important in the prevention of this overlooked but serious disease.